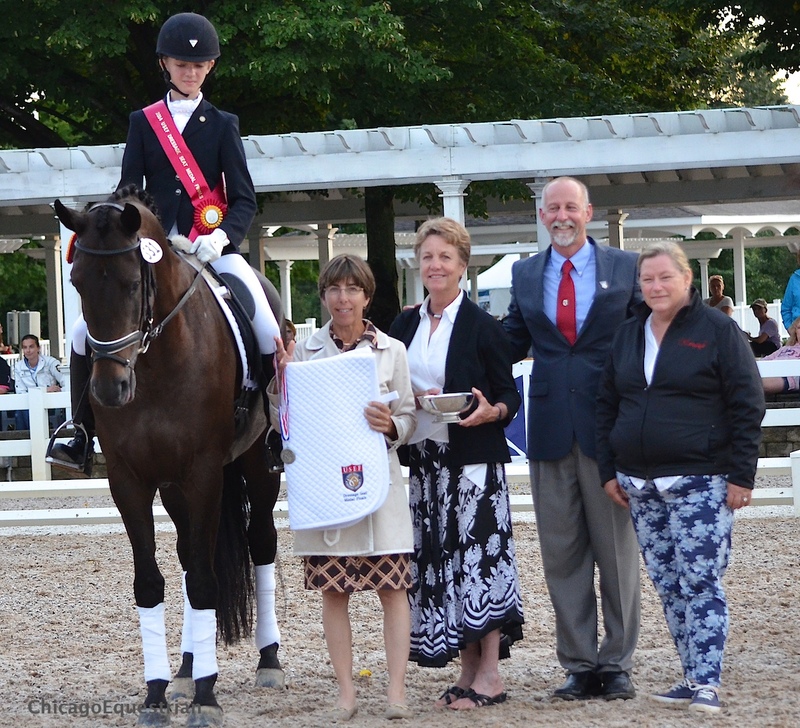 Endel L. Ots and Donatus receive the Developing Horse Grand Prix Championship from Jane Weatherwax and Markel owners Lisa and John Seger. 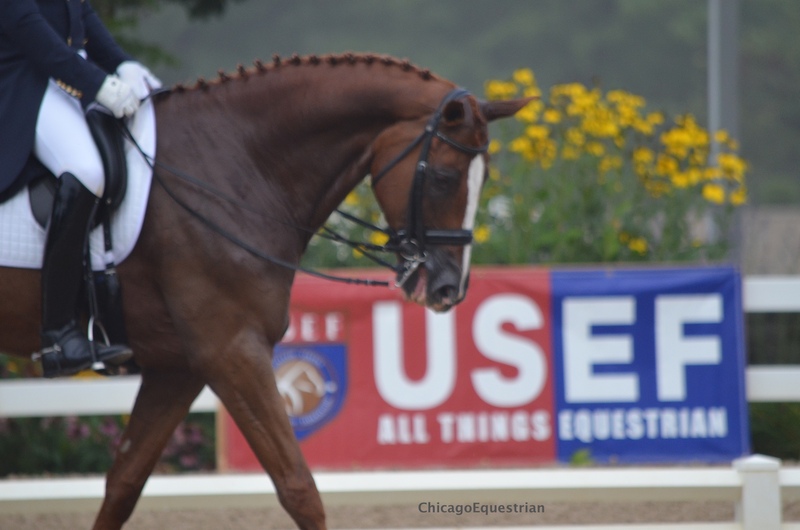 Wayne, IL – August 23, 2014 - Lamplight Equestrian Center hosted the Markel/USEF Young and Developing Horse Dressage Championships presented by HorseShow.com. 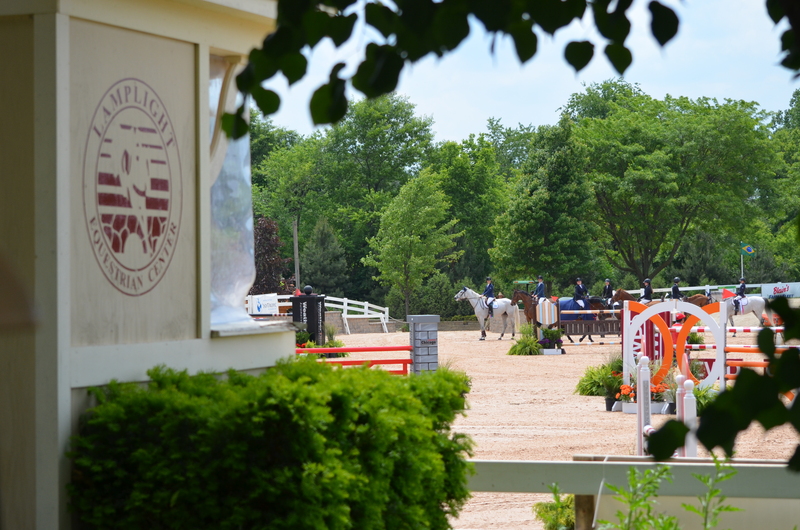 Spectators filled the VIP tables to watch the final day of competition for the Developing Horse Grand Prix Championship, the FEI Five-Year Olds, the USEF Four-Year Olds, and the USEF Dressage Seat Medal Final 13 and under. The event was also live streamed by USEFNetwork. Sunday will include the Championships for the Developing Horse Prix St. Georges, the FEI Six-year olds and the USEF Dressage Seat Medal Final 14-18. Lamplight Equestrian Center’s owner, Nina Moore, is pleased to have an event of this caliber in the Midwest. The competition consists of two days of tests for each division. The first test is weighted at 40% and the second and final test is weighted at 60% to arrive at the overall score. All exhibitors must qualify between January 1 and July 28 of the current year to enter. Starting the morning off with a win in the USEF Developing Horse Grand Prix Final was Endel L. Ots and Donatus, a ten-year-old Wurttemberger gelding owned by Everglades Dressage of Wellington, FL. The pair had the top score of 68.640 in the Intermediare II from Thursday and a score of 69.917 in the Developing Grand Prix test today for the overall score of 69.406 to hold the lead. Ots, a supporter of the program, has a four-year-old he shows as well and plans to continue to bring horses along through the program. 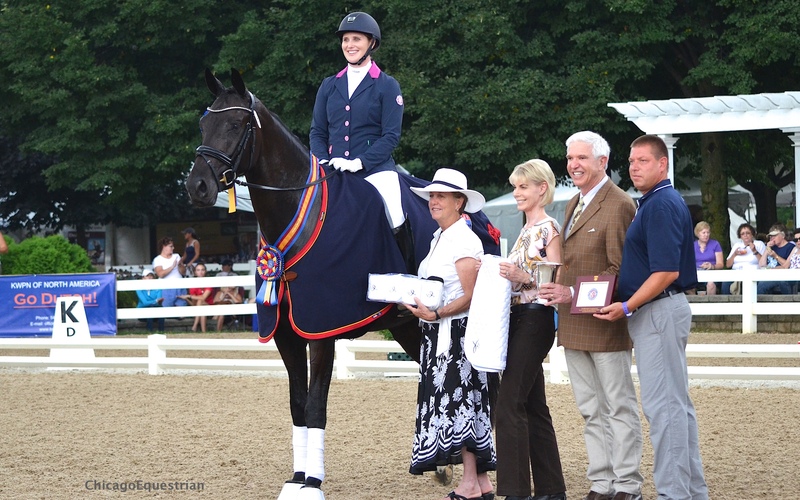 Emily Wagner and Wakeup have participated in the program for several years, winning the Reserve Championship this year. Finishing in reserve was today’s class leader, Emily Wagner, 26, and Wakeup, who also won the Best American Bred Horse in the division. The pair resides in LaCygne, KS. Wagner and her mount scored 68.246 in Thursday’s class and a 70.042 for today’s win and a total of 69.324 for second place honors. Wakeup and Wagner won the Prix St. Georges Championship Class in 2013. They have come up through the ranks of the Developing Horse Program competing as a four, five and six-year-old as well. Both Ots and Wagner raved about showing at Lamplight, commenting on how beautiful the grounds are and despite a good amount of rain, the footing was excellent. They are both looking forward to returning next year. 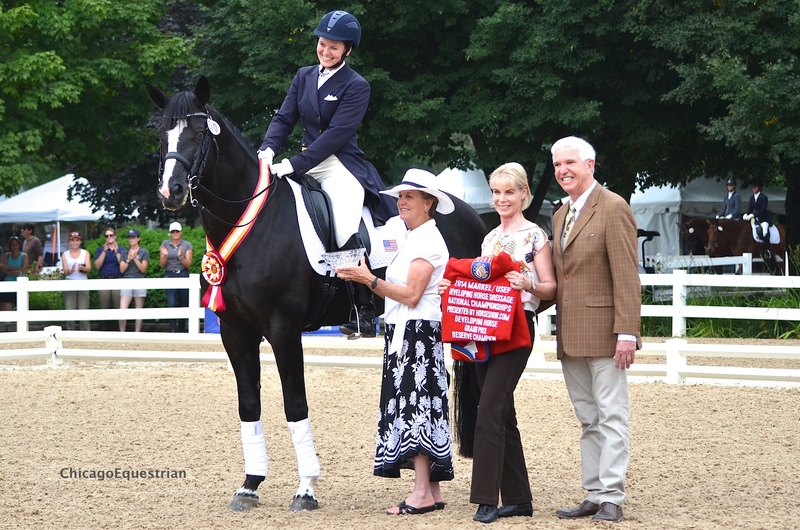 Winning the FEI Five-Year-Old Championship was Kelly Casey, 30, of Livermore, CA and her mount, Emilion SA. The 2009 KWPN gelding took the lead in Thursday’s Preliminary class with an 86.200 and added an 87.200 in the Final for an overall score of 86.800 to clinch the win. Kelly Casey and Emilion SA won the Five-Year-Old Championship. Casey and a friend of hers bought the Dutch Warmblood gelding in Holland, unbroken and brought him over a year ago in July. Several people mentioned she should try him in the young horse program, so she did. Casey enjoys the young horse program and the championship show grounds. Patricia Becker of Wadsworth, IL, rode Joan Pecora’s Edward to the reserve spot with 84.600 and 85.600 for an overall total of 85.200. 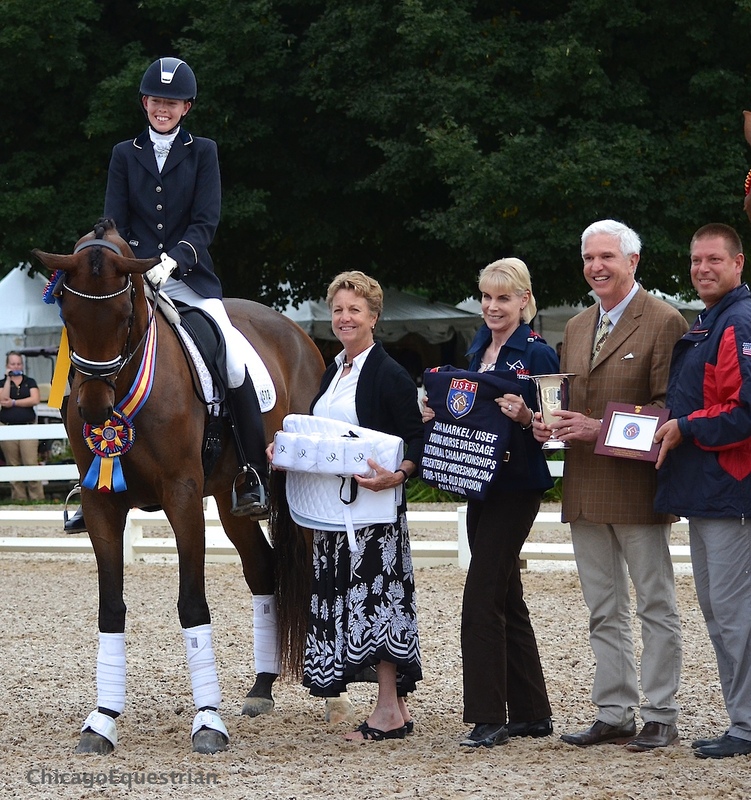 It was Amy Miller’s KWPN gelding, Encore (Jazz x Aloha SE/Sir Sinclair), who won the Best American Bred Horse in the five-year old division and placed fourth overall. The pair traveled from Fullerton, CA. Rosalut NHF and Carly Taylor-Smith, 24, of Malibu, CA won the FEI Four-Year-Old Championship with an overall score of 89.560. Their score from Thurdsay’s test was 88.300, adding a 90.400 from the final yielded them the highest score and the Championship. Judges generously awarded the Oldenburg gelding a 9.3 for the trot, 8.4 for the walk, 9.4 for the canter, 8.8 for submissiveness and 9.3 for overall impression, earning them the highest young horse scores of the day. Rosalut NHF (Rosenthal x Legacy/ Salut) earned the Best American Bred Horse for the Four-Year-Olds. Carly Taylor-Smith and Rosalut NHF win the Four-Year-Old Championship and Best American Bred Horse in the division. Taylor-Smith’s mother, Nikki, bought him from a show jumping barn and sent him to her in February. “My mother is not getting the horse back!” laughed the winner. Carly Taylor-Smith plans to return to Lamplight next year for the Five-Year-Old Championship. “I’ve never been to Lamplight before but it’s really nice. It’s my first big show in the United States,” added Taylor-Smith. The young rider is originally from England and hopes to become a US Citizen so she can compete on a US Team someday. Another Californian took the Reserve Championship, Famebria DG and Willy Arts of Hanford, CA, earned an 83.600 and 85.400 for an overall score of 84.680. DG Bar Ranch and Natalie Bryant own the KWPN mare. After the judges put the medal riders through their paces and scored their test rides, it was Helen Claire McNulty, 14, of Holland, MI, who came out on top. McNulty rode Checkmate, a fourth level horse, and trains with George Williams. Dressage Seat Medal Winner 13 and under, Helen Claire McNulty. McNulty’s mother was another exhibitor who expressed that Lamplight was her favorite place to show. The family has shown at Lamplight for years and always looks forward to returning. 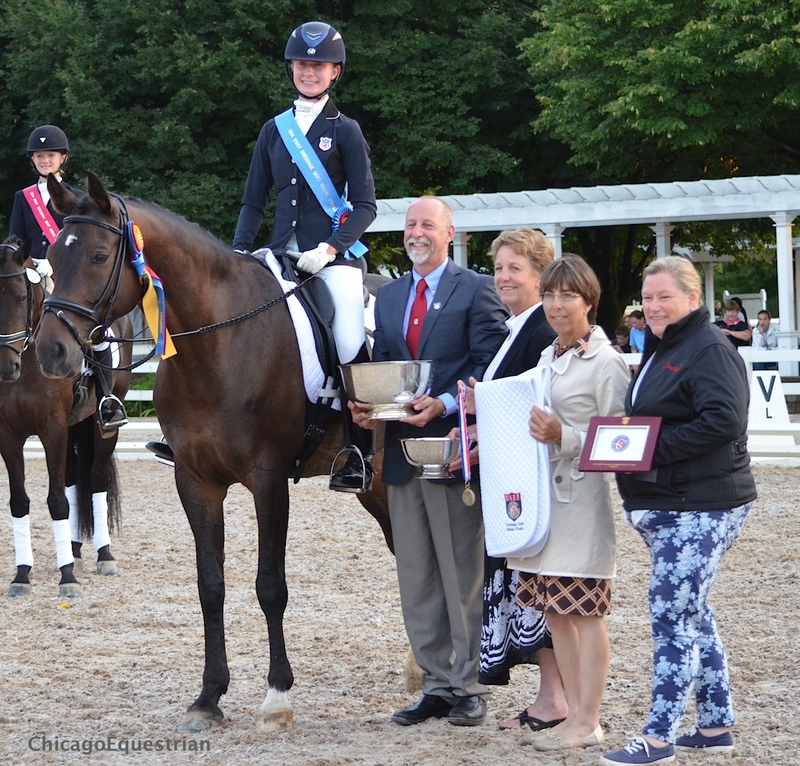 Nia Kinney, 12, Dallas, TX, took the Reserve Championship in the Dressage Seat Medal 13 & under. 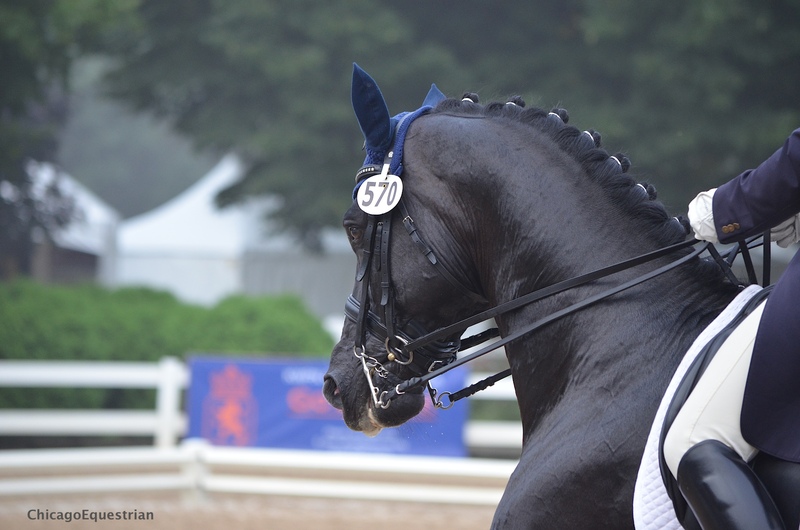 Sunday will wrap up the Championships with the USEF Dressage Seat Medal Finals 14-18, the Prix St. Georges Championship and the FEI Six-Year-Old Finals. *From USEF Website – www.usef.org.